Former Brown University School of Medicine clinical professor, Dr. Thomas K. Warcup, will lead this first-of-its kind practice as medical director. 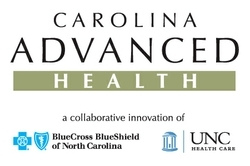 Carolina Advanced Health will be located at the Quadrangle Office Park in Chapel Hill. Chapel Hill, N.C. – Blue Cross and Blue Shield of North Carolina (BCBSNC) and UNC Health Care today announced Carolina Advanced Health as the name for the new medical practice developed by the two organizations that will open later this year. Dr. Thomas K. Warcup, the practice’s medical director, will be charged with leading the practice in which patients – not just their symptoms – are the focus of care. In January, BCBSNC and UNC Health Care announced an effort to develop a new type of medical practice to improve health, increase satisfaction and reduce health care costs for patients. The advanced medical practice will extend beyond what is currently called the ‘medical home’ and enable teams of health care professionals to work collaboratively with patients and families in delivering high-quality, coordinated care. Dr. Warcup is a board certified family physician with 10 years of clinical and administrative experience. He most recently served as the president of the South County Hospital Medical Staff in Rhode Island. He was also an associate clinical professor of family medicine for Brown University School of Medicine. Carolina Advanced Health will be located in the Quadrangle Office Park, located at I-40 and Highway 54 in Chapel Hill. The practice will open in late 2011. It will care for 5,000 BCBSNC customers and focus on patients with chronic conditions, including coronary artery disease, hypertension, diabetes, obstructive lung disease, major depression and asthma. In November, eligible patients will begin receiving information in the mail about how to enroll in the practice. Blue Cross and Blue Shield of North Carolina is a leader in delivering innovative health care products, services and information to more than 3.7 million members, including approximately 900,000 served on behalf of other Blue Plans. For 77 years, the company has served its customers by offering health insurance at a competitive price and has served the people of North Carolina through support of community organizations, programs and events that promote good health. Blue Cross and Blue Shield of North Carolina is an independent licensee of the Blue Cross and Blue Shield Association. Access BCBSNC online at http://www.bcbsnc.com. The UNC Health Care System is a not-for-profit integrated health care system owned by the state of North Carolina and based in Chapel Hill. It exists to further the teaching mission of the University of North Carolina and to provide state-of-the-art patient care. UNC Health Care is comprised of UNC Hospitals, ranked consistently among the best medical centers in the country; the UNC School of Medicine, a nationally eminent research institution; the Triangle Physician Network of community practices; home health and hospice services in seven central North Carolina counties; and Rex Healthcare and its provider network in Wake County.